Description: It's 1888, and seventeen-year-old Verity Newton lands a job in New York as a governess to a wealthy leading family--but she quickly learns that the family has big secrets. Magisters have always ruled the colonies, but now an underground society of mechanics and engineers are developing non-magical sources of power via steam engines that they hope will help them gain freedom from British rule. The family Verity works for is magister--but it seems like the children's young guardian uncle is sympathetic to the rebel cause. As Verity falls for a charming rebel inventor and agrees to become a spy, she also becomes more and more enmeshed in the magister family's life. She soon realizes she's uniquely positioned to advance the cause--but to do so, she'll have to reveal her own dangerous secret. My Thoughts: Verity Newton finds herself in the thick of revolution when she accepts a job as governess to three children in New York. Verity begins her adventure by being present when a group of masked bandits rob the train she is riding to New York. Then she encounters the Rebel Mechanics when she is on her way to her job interview. This is alternate history. The American Revolution never happened. The colonies are controlled by the British who have magic and who strongly discourage any technical inventions that would put their rule at risk. 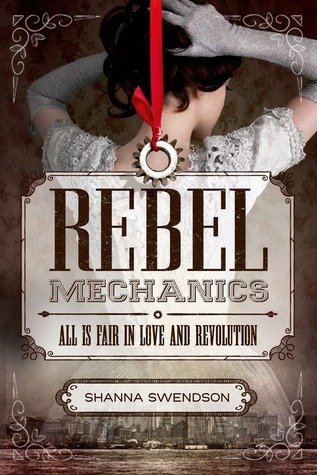 The rebels are inventors and engineers working with steam engines and other non-magical sources of power. Verity is befriended by the rebels and is uniquely placed to be able to spy for them. Her charges are the grandchildren of the Duke of New York who is in command. Her charges' guardian is Lord Harry Lyndon, the children's uncle, who portrays himself as an eccentric entomologist but who Verity learns is actually in command of the Masked Bandits. Verity also has a secret that could put her in danger. She also has magical abilities but isn't of the magister class. That puts her in danger if the ruling magisters find out because they would see her as an abomination. The book was filled with wonderful steampunk inventions. It was also a romance though not one with a happy ending. Verity is a very plucky 17 year old and a great character. I doubted a man responsible for three orphans would go about such risky business as banditry when he clearly had no need of funds. I must have been mistaken. There were probably dozens of men in the city with similar eyes. I was surprised to realize I felt slightly disappointed. If I had to be a governess, working for a bandit would make my life much more exciting. Now I supposed I had to hope for something like a madwoman in the attic, or perhaps a ghost. I got this ARC from Macmillan. You can buy your copy here.